Intel’s new device can read your dryer’s mind. Intel will show off an experimental device this week in China that could someday substantially cut the costs of wiring homes and offices for energy efficiency, one more step in the company's foray into energy. "Turn-on and turn-off signatures are like fingerprints," said Justin Rattner, Intel's chief technology officer in an interview. "Compressors, motors, TVs, stereos -- all of them have a unique signature. It is relatively easy to train the system to recognize these things." In the first stage, these devices will merely provide data to home energy consoles, but over time, remote control capabilities will be added so that lights can be turned off or thermostats turned down -- either by a person or a computer -- to save energy. Think of it as a Digital Mom ("Did you turn the lights off in your room...," etc.) without the guilt. Intel will work with Flextronics to get the first commercially available versions out later this year. A million homes or small office buildings rigged with automation equipment could curb the need to build a good number of 600 and 700 megawatt power plants, he said. "We believe that 30 percent of energy consumption is controlled by the consumer," said Rattner, who will show off the device and conduct other demonstrations during a speech at the Intel Developer Forum in Beijing this week. --Smart grid. Intel is working with the State Grid Corporation in China. It is also a big supporter of Grid Net, the company that wants to use WiMax in the grid. Intel has been behind the WiMax concept since the beginning. --Wind. There are ten processors in the average wind turbine. 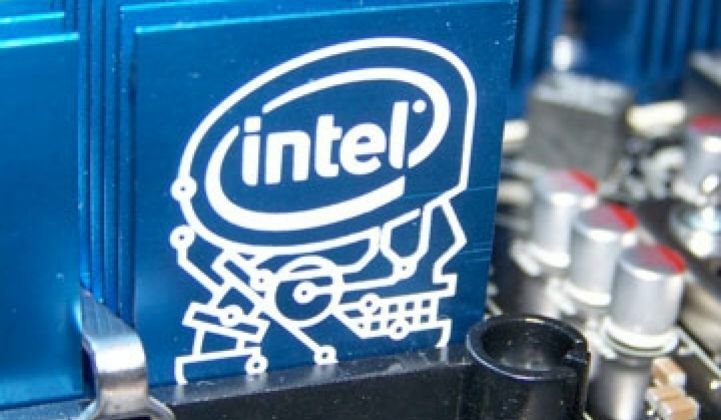 Intel sells to some large vendors already. --Demand response and efficiency. The company is already an investor in CPower. --Green IT. Intel in 2001 kicked off an effort to reduce power consumption in chips. That was to prevent computers from melting. The company shifted its emphasis to power savings as electricity prices climbed. --Solar. Intel has spun out a few startups in solar already and Intel Capital has invested in some as well. Solar cells are basically just semiconductors. Intel may not ever produce solar cells itself, but expect it to try to get its technology for chips more integrated into solar. --Talent. A growing number of green startups are headed by Intel alums. The company has a knack for producing people well-versed in technology and marketing, running employees ragged and wearing down anyone that tries to resist their sales pitch. VCs love that. Others not listed in that link are Carlos Perea, CEO of Miox, Dan Russell, CEO of PowerMand, and First Solar president Bruce Sohn.